You probably have heard of screen resolution before, but you may not understand what it means. Phone, laptop, computer monitor and television manufacturers will typically advertise what their products’ resolution is. There are a number of terms and numbers used to describe resolution such as 720p, 1080p, 4k, 8k, HD, Full HD, Quad HD and Ultra HD. Unless you keep up with the latest tech news, you’re probably confused about what some of those terms mean. This guide will explain everything you need to know about screen resolution, and what all those terms mean. Modern day displays such as your television or computer screen create images by combining thousands of tiny dots of color. These tiny dots of color are called pixels. Pixels are the smallest part of a digital image. Each pixel can be lit up to be one of several colors, usually either red, green and blue or magenta, cyan, yellow and black. Hundreds of thousands of these small points of light combine to create the image we see on the screen. Screen resolution is how many pixels the screen horizontally by the number of pixels the screen has vertically. Screen resolution is written with the horizontal value first, and the vertical value second. A display with a resolution of 1920 x 1080 means that there are 1,920 pixels from left to right and 1,080 pixels from top to bottom. 720p refers to a screen with a resolution of 1280 x 720. Original televisions and computer displays had a resolution lower than 720p. When the first 720p displays came out they were referred to as high definition, or HD. 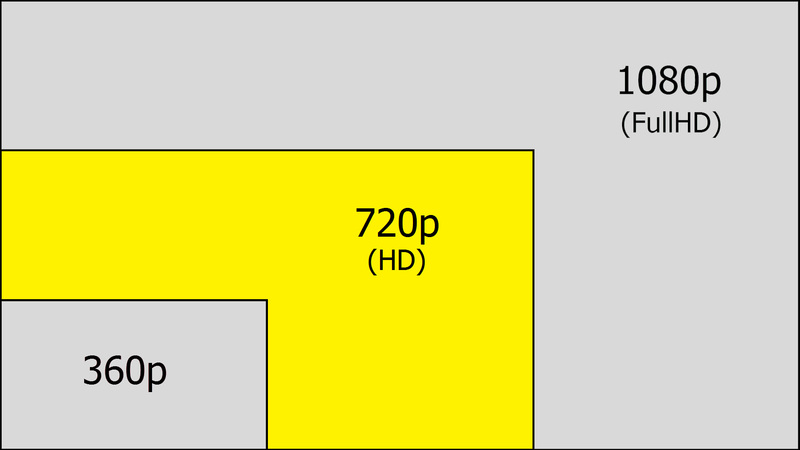 Today, the term HD can refer to any screen with a resolution of 720p or higher. Almost all displays made today have a resolution of at least 720p, so the term high definition can be misleading. 720p displays today are the absolute cheapest option available. 1080p refers to a screen with a resolution of 1920 x 1080. 1080p screens are also called Full HD or FHD screens. 1080p screens sometimes are just referred to as HD screens, so if you see a screen being advertised as HD look closer to see if the resolution is 1280 x 720 or 1920 x 1080. 1080p is the most popular screen resolution used today. It is relatively inexpensive compared to other higher resolution displays and is usually worth the small price increase from 720p. 1080p is a good resolution for the standard console models and for low to mid-range PC gaming rigs. 1440p refers to a screen with a resolution of 2560 x 1440. This is twice as many pixels on each side as a 720p screen, and four times as many pixels total. 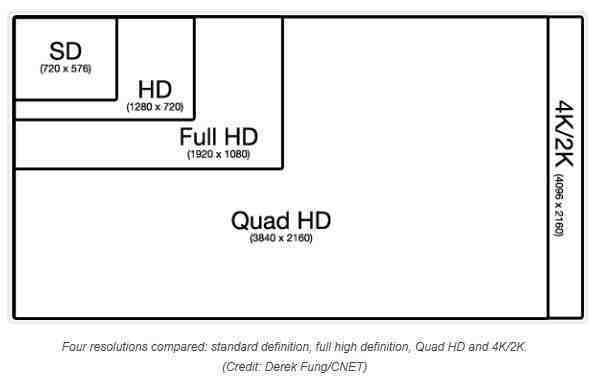 1440p is sometimes referred to as Quad HD because it has four times as many pixels as 720p. 1440p is often seen on smartphones and computer monitors. It is less often seen on televisions. 1440p is a great screen resolution for mid-range PC gaming rigs. 4k usually refers to screens that have a resolution of 3840 x 2160. In the movie projection industry, however, it refers to a resolution of 4096 x 2160. 4k refers to the horizontal edge having approximately 4,000 pixels. 4k screens have twice as many pixels on each side than a 1080p screen and have 4 times as many pixels total. 4k screens are also referred to as Ultra HD or UHD screens, but again this can be confusing since 8k screens are also sometimes referred to as UHD. Usually, if you see UHD it will refer to 4k because there are not many 8k televisions being made today. In future years, however, that will likely change. 4k displays are a good choice for those with high-end PC gaming rigs. 4k televisions are also a good choice for those with an Xbox One X or a PS4 Pro. 8k usually refers to screens with a resolution of 7680 x 4320. Similar to 4k, 8k refers to the horizontal edge having approximately 8,000 pixels. 8k screens have twice as many pixels on each side when compared to 4k screens. This means it has 4 times as many pixels as a 4k screen, and 16 times as many pixels as a 1080p screen. 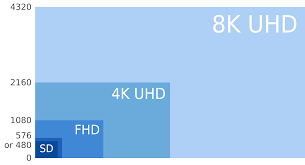 8k screens are sometimes called 8k UHD screens. There are very few 8k screens being made today. There is very little content being made for 8k screens today as well. In the future however, this is expected to change. What screen resolution do you want when you are buying a laptop, television, phone, etc.? Higher resolution is always better, because even if the content you are viewing is in a lower resolution it can still be viewed on the higher resolution screen. The problem is higher resolution screens are more expensive. If you are looking for the cheapest option possible, you should go with 720p. However 1080p is quickly becoming the standard display for many phone, laptop, and computer monitor manufacturers, and you will likely be able to find many 1080p devices that aren’t much more expensive than a 720p option. When buying a display, you should consider what you will be using it for. For example, while a 4k screen has a higher resolution than a 1080p display, if you are only using the screen to view 1080p content there is no need for a 4k screen. Video services such as Netflix have 4k content, but it costs extra. The standard Netflix package only has 1080p content. Xbox One X and PS4 Pro are the only consoles that can play games in 4k. While an 8k screen is the highest resolution for consumer displays today, there is almost no content for it, which means for most people the expense is not worth it. Game developers have not started making games in any resolution higher than 4k, so for gaming there is absolutely no reason to break the bank getting a 8k television. What screen resolution should I get for PC gaming? While higher resolution displays are capable of producing a better picture, when you are gaming it is only worth it if the rest of your hardware can produce a 4k image quickly enough to play a game without lag or other issues. Usually when gaming you want at least 60 frames per second, so you have a smooth image. If your computer can only play a game in 4k at 30 frames per second or less, you may want to play the game in 1080p or 1440p, so you have a smooth gaming experience. 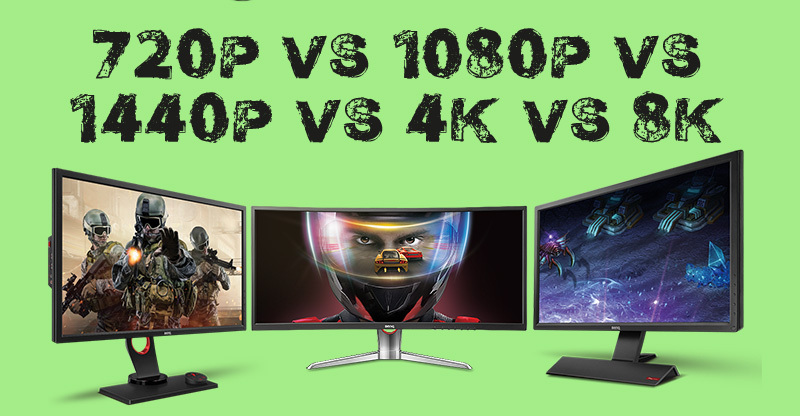 In this case you should get a 1080p or 1440p monitor or laptop. If you have a sufficiently powered computer, you should go with a 4k monitor if you can afford it. Typically, you will want at least a Nvidia GTX 1070Ti or an AMD RX Vega 64 if you want to play games in 4k resolution. 1440p is usually a good middle ground, offering a higher resolution than 1080p but without requiring the most expensive graphics cards. What screen resolution should I get for console gaming? If you have a current generation console, you should go with either a 1080p television or a 4k television depending on whether you have the standard model console or one of the more powerful consoles. The standard PS4, the Switch and the Xbox One are only capable of playing games at 1080p, so if you are looking for a television to play one of these consoles on you should go with a 1080p television. One of the main features of the PS4 Pro and Xbox One X is their ability to play games in 4k resolution. If you have one of these consoles you should strongly consider a 4k television, so you can fully utilize these consoles capabilities. If you are looking for a television to play retro games you won’t need anything more than a 720p television, however a 1080 television may be worth it if you are also going to use it to watch television or movies. How important is screen resolution in a display? Screen resolution is just one factor you should consider when buying a monitor. There are other factors to consider such as refresh rate, color accuracy, display size, and whether the display is standard LED display or an OLED display. When gaming refresh rate is an equally important factor. The size of the display changes the importance of screen resolution. If you have a smaller display, screen resolution will be less important than in a giant display. Color accuracy helps create a better picture. OLED displays allow individual pixels to be turned off, which greatly improves the color accuracy of dark and black images. Make sure you do your research on the other factors that influence display quality before purchasing a monitor or television. Overall screen resolution is important, but only one factor you should consider when buying a display.